Sian Prior thought she was in for a tough mountain trek through southern France. With a little cheating and a lot of good food, she discovered that a 120 kilometre hike could be an exercise in hedonism. 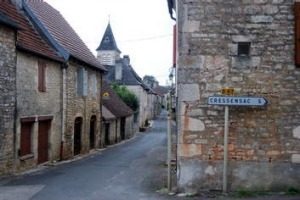 Early on in our seven-day walking tour through the hilltop villages of the Dordogne it dawns on me that this is actually an eating tour. Scottish company Macs Adventure has planned our itinerary, booked our hotels and will transfer our luggage. All my companion and I need do is follow the maps provided and hike between the officially designated ''Plus Beaux (Most Beautiful) Villages de France''. Our circular route will take us through the departements of Correze, Dordogne and Lot. ''Lot'' seems an apt description for the 20 kilometres we'll cover most days. Last stop will be Rocamadour, the spectacular mediaeval town after which the famous French cheese is named. We begin in the tiny village of Sarrazac where the pre-paid courses at the Hotel de la Bonne Famille just keep coming: almond-flaked trout with buttery sauce; walnut-crumbed rocamadour and fig salad; pear tart followed by rind-flecked lemon sorbet, washed down with a 2009 merlot. On the first morning we hike past paddocks of slow-munching cows to L'Hopital Saint-Jean, site of a former leper colony. In the main street two elderly women point out a stone tower where in ancient times a fire would be lit to guide pilgrims home. In Collonges La Rouge the grey buildings of Correze are replaced by startling red sandstone dwellings, stained by iron oxide. In this eighth-century National Heritage-listed village, artisans sell everything from silver jewellery to fresh sorbets. 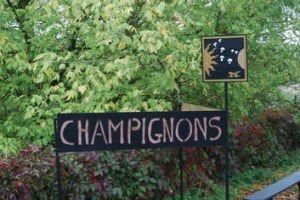 We enjoy a glass of champagne in the sun before staggering to the next hotel in Meyssac. In the Relais du Quercy we're rewarded with another four-course dinner: grated carrot, egg-onion-and-nutmeg tart and steamed beetroot with mustard sauce, followed by roast duck with baked potatoes, more sorbet, and a cabernet-syrah des larmes (of tears). A cheese platter is carted between tables - soft and hard, blue and white, wet and dry. The diners next to us look grief-stricken when the platter is lifted from their table and brought to us. The route out of Meyssac meanders through sun-dappled forests and raked fields of walnut trees. I help myself to the stray nuts on the path and blackberries draped over moss-covered fences. Today's hike should be 17 kilometres but after 18 we're nowhere near our destination so we cheat and hitch-hike the rest of the way. We've organised a rest day in Beaulieu-sur-Dordogne (beautiful place on the Dordogne river). In the 11th century abbey church there are intricate carvings of the Second Coming complete with angels blowing trumpets into Christ's armpits. We picnic beside the river where bemused locals stare as we brave the water, avoiding the boats that drift past in the glinting sunshine. On the terrace of the Hotel les Charmilles we sip kir royales while a narrow branch of the river rushes past. At the cafe Les Flots Bleus (The Blue Torrents) the highlight is an apple spring roll with salted caramel ice-cream. What better way to replace all that sweat? The next morning we cheat again and take a taxi to the top of the first big climb then amble through the forest, leaving a trail of meringue crumbs. We pass the ruins of ancient bread ovens and a stream converted into a fish farm. Nature is one big food factory around here. Mid-afternoon we join the winding road that leads to Le Port de Gagnac. At the Hostellerie Belle Rive, overlooking the River Cere, the waitress brings us two vegetable soups presented in one double-scoop serving plate, making this a five-course meal. The following morning we cadge a lift with an elderly monsieur who plays us waltz music on his car cassette player. He drops us at the Chateau de Castelnau-Bretenoux, a 12th-century castle lovingly restored in the early 1900s by an eccentric opera singer with a collection of giant wardrobes. We trek on through vineyards and orchards, stopping in Autoire to buy vials of fragrant dried mushrooms. Day six we visit the Gouffre (chasm) de Padirac, a 40-kilometre complex of limestone caves which has 350,000 visitors each year. Taking the lift down through a jagged hole in the earth we travel by boat along a subterranean river, where huge backlit stalactites look like dripping sorbets. Our final day's walk takes us along the Alzou canyon where Rocamadour looms up like an architectural mirage clinging to the cliff. Rising above Rocamadour's main street are seven sanctuaries carved into the sheer rock face. Fuelled by our last block of chocolate we climb the 223 stone steps to the church of Notre Dame, destination of pilgrims and penitents for 10 centuries. The taxi back to the hotel is a no-brainer. There's still one more four-course meal awaiting us. FLY Return flights Melbourne to Paris (April), Etihad Airways, $1755. STAY Hotel de la Bonne Famille, Sarrazac, 58 euro ($90) a night. 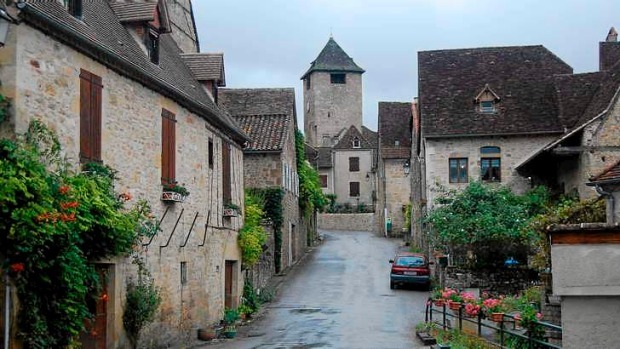 L’Auberge l’hotel des Charmilles, Beaulieu sur Dordogne, 64 euro a night. EAT Restaurant Les Flots Bleus, Beaulieu sur Dordogne. Restaurant Hostellerie Belle Rive, Port de Gagnac.